Agriculture is one of the most dangerous occupations in the United States. Agriculture teachers play a vital role in educating the farmers of tomorrow. Incorporating occupational safety and health topics into the classroom can keep the new generation of farmers, farm families and workers safer and healthier. UMASH is offering FREE resources to educators to assist in the effort of teaching agriculture safety and health. We are currently developing a curriculum calendar for the 2019-2020 school year and would love your input! Below are some featured agricultural health and safety resources to get started on your planning! We will be updating this page with additional resources and a full academic calendar – so be sure to check back, and sign up for our mailing list to receive the latest information. 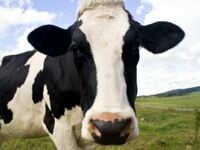 This resource includes 5 videos which were developed as a training tool for dairy farm owners and workers. 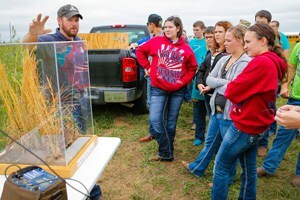 The accompanying lesson plans were developed by UM Agricultural Education faculty, staff, and students as part of a collaborative initiative to advance agricultural safety education within school-based agriculture. 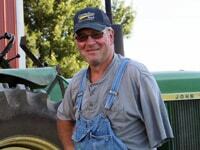 This resource is focused on “real life” farmers telling their stories of injury or a fatality on the farm. These stories show how dangerous agriculture can be for people of all ages while also incorporating prevention messages. Discussion guides suitable for classroom use are currently available for two stories. The questions are designed for students to reflect on similar situations and use critical thinking skills for further discussion. Teacher Answer Keys are available upon request. UMASH conducted a survey of 969 FFA students at the 2018 National FFA Convention. The results showed that FFA students are hungry for additional and continual ag health and safety training to bridge the gap between farmers and consumers. These two videos are a fun, engaging way to teach youth about food safety and the science behind biosecurity, and practical methods to prevent food borne illness and zoonoses at fairs or other agritourism events. These and other agritourism videos are also available on our Agritourism Resources page. Visit website for scholarship opportunities, continuing education, and course information. 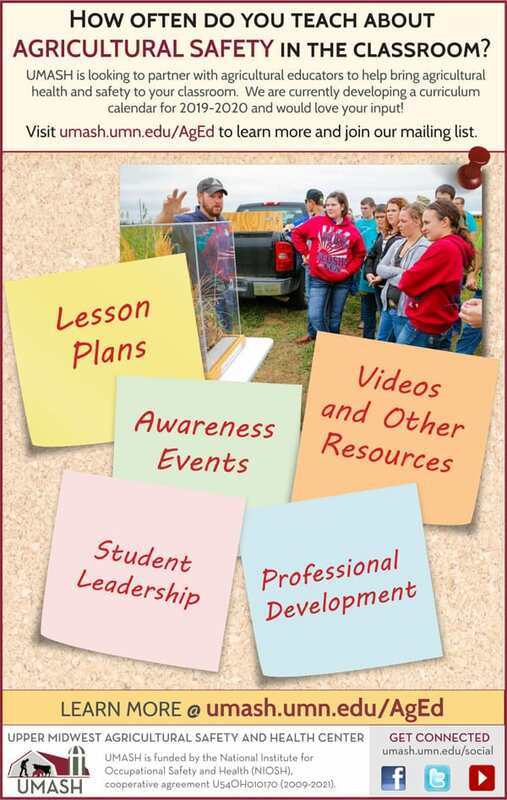 These webinars are designed for teachers, Extension staff, 4H and FFA leaders and others who work with young adults.